I have router Asus WL-520GC with 2Mb flash memory and would like to use DD-WRT MEGA firmware. 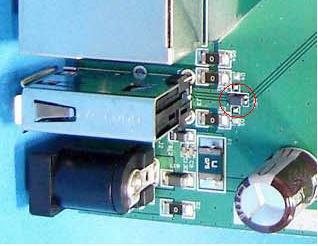 In this case for the start of router and mounting partition on usb flash drive, std-nokaid_usb.bin is used. For the use of this method on 2mb devices with USB onboard (like ASUS WL-520GC, possibly also devices with SD/MMC support and low flash size),it is necessary to build 2Mb firmware with usb and jffs support (cleaning all superfluous, including web-interface). Sounds like a very interesting idea, and it would certainly give dd-wrt an unprecedented flexibility. I'm rebuild dd-wrt-micro-plus-ssh and delete ssh, pppoe. It allowed to free almost 500кб of free space, and I added drivers for usb. 520GC unlike 520GU has power 9V DC, therefore for the use of USB it is necessary to stabilize it to 5V DC. Also, usb-data lines must have resistors for a concordance. Now my WL-520GC have USB port and running dd-wrt mega from usb flash drive. Congrats! Is there a way you can give us, a step by step process of what you did. Including the Hardware mod that you did. I always hoped that once USB support on routers became more common that dd-wrt could evolve into something like the slug (nearly all of its alternative firmwares utilize USB storage). Today I do an improvement and simplification of hardware mod and in the evening will do a step by step process. USB and DD-WRT MEGA on Asus WL-520GC. 1. You must use 5V 2A power adapter for router. 2. On board : NF1 – data+ & data-, resistors 20 – 50 Ohm. 3. F1 – resistor 0,2-0,5 Ohm (you can use 0 Ohm), BF12 – resistor 0 Ohm.C9 (C130) - SMD 0,1mF or any other 0,1mF between +VCC USB and GND. 4. R56, R3 – 0 Ohm. 2. Go to /rootfs/usr/sbin and remove 2 files: dropbearmulti и pppd. 3. Copy into /rootfs/lib/modules/<kernel>/ drivers: usbcore.o, usb-ohci.o, scsi_mod.o, usb-storage.o, sd_mod.o,ext2.o. (from unpacked nokaid, mega). 7. Build firmware image and put it into router. 9. Unpack MEGA firmware and put contents of rootfs to partition on usb flash drive. Change all files owner to 'root'. Now, you can boot router from usb flash drive avtomaticaly if usb flash drive with ext2 partition is plugged. GREAT job lightix. This means that any router with USB can now be made able to use Mega version of dd-wrt, plus more! What a great proof of concept. Added links to firmware and unpacked rootfs of MEGA. After that, can you use it as standalone downloader..